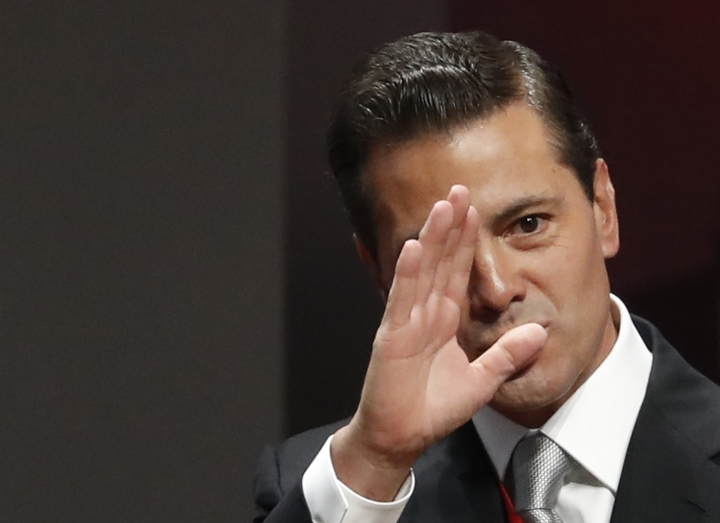 MEXICO CITY — Less than two months before President Enrique Pena Nieto leaves offices, his administration is seeking to shield itself from a corruption investigation that has the potential to sweep up federal officials. The presidency's legal office filed a motion with the Supreme Court seeking to protect federal officials from being targeted in a criminal process underway in northern Chihuahua state over public funds purportedly diverted to a campaign of the governing Institutional Revolutionary Party, or PRI for its initials in Spanish. It is the first publicly known case in which the president's legal office has sought to protect him and his officials in a corruption investigation. The Supreme Court received the filing Oct. 11, but it was not made public until the newspaper Reforma published its contents Wednesday. The legal document is public. Last December, authorities detained Alejandro Gutierrez, a former high-ranking PRI official, for alleged participation in a plan to siphon off the equivalent of $12 million in Chihuahua state public funds for political campaigns. The money was allegedly diverted in 2016, and state authorities are searching for former PRI Gov. Cesar Duarte, who is currently a fugitive. Gutierrez was acquitted in the case and freed last month. Javier Corral, Chihuahua's current governor from the opposition National Action Party, has been a staunch critic of federal action in the case. In an interview after Gutierrez's exoneration was announced, he called the entire process a "pretense." "Corruption was not encapsulated in the states," he said, but rather "rose to the federal level, touched officials from the government of Pena Nieto and Pena Nieto himself, and for that reason they have resorted to these acts of cynicism." Against that backdrop, the presidency's legal office this month filed the motion against Corral and judicial authorities of Chihuahua seeking to block any "existing or imminent" legal actions against "current or prior federal public officials," either "directly or indirectly (related) to the exercise of their duties." While it is common in Mexico for public officials who fear an investigation to appeal to courts against future legal action, there is no precedent for it being done by the presidency to the high court. Cases of alleged corruption have dogged Pena Nieto's government, and at least three PRI ex-governors are under arrest. Analysts consider it one of the main reasons his party lost the presidential election in July.